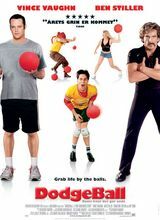 Sports comedy follows a group of schlubs' attempt to save their favorite gym from a corporate takeover by participating in a dodgeball tournament. Peter LaFleur, affable everyman and chronic underachiever, makes his trade as the proprietor of the fledgling Average Joe's gym, playing host to a cast of veritably eccentric patrons running the gamut from a self-proclaimed pirate to a sports-history savant. Trouble appears on the horizon when Average Joe's' financial insolvency leads to the threat of foreclosure and related takeover attempt at the hands of corporate juggernaut Globo Gym, forcing Peter's offbeat clients to form a dodgeball squad with a view to winning enough money at a high-stakes tournament to earn their beloved gym another day.